Join the MaxLove Project community in supporting families facing childhood cancers with with quality of life care, fierce foods, whole-body wellness resources, education and research. A lollipop stand is an awesome way to volunteer and give back while having a great time with friends and family. What is a Lollipop Stand? It's just like a lemonade stand! The only difference is that the product you’ll sell is healthy sugar-free lollipops created by our friends at Dr. John’s Sugar-Free Candy. It’s easy, fun and creative! All you need to do to get started is outlined below, and please reach out to us if you have any questions at info@maxloveproject.org. Join the Lollipop League online. Consider posting to social media after your've started your campaign to let your friends and family know what you're up to and why. Set a date and a location. Decide when and where you'd like to host your Lollipop Stand. Sell your lollipops in your neighborhood, at your school, church, local grocery store and to your friends and family! Create a sales plan. How much will you sell the product for? Discuss with your team/family how much do you need to sell your lollipops for in order to make the money back that you spent to purchase the lollipops. Ideally you would sell the product at a higher price than what you purchased it for in order to both reimburse yourself for the purchase and also make some extra money to donate back to MaxLove Project. Marketing: How will you tell people about what you're doing and invite them to your event? Will you post to social media, print out flyers, or create invitations? Collecting money: Decide how you are going to take money for your customer’s purchases. Hint: the easiest way for you to collect money is cash. Optional: Use your MaxLove Project Lollipop Stand fundraising page. This will help you collect payments for lollipops using credit cards or for people who are far away. Optional: Let your customers know that you are willing to take donations for MaxLove Project in addition to selling your lollipops! If you choose to host a table, or stand, or even if you will keep a candy sales bag with you, you can make your lollipop sales POP! Make sure to make a sign. This way, people will know what you are selling and donating to! Share on social media and invite friends and family to support your efforts. Tag MaxLove Project and email images to us at info@maxloveproject.org so we can share your great work. You can either process your donation online through your Lollipop League page or via mail (and we'll manually add to your page). Help us learn from your so we can make this into an awesome volunteering opportunity for kids across the country! Please share your post-event feedback with us HERE. Introducing our new THRIVE® line of nutritional candy. This takes our line of sweets even further and has even more health benefits, without sacrificing taste. 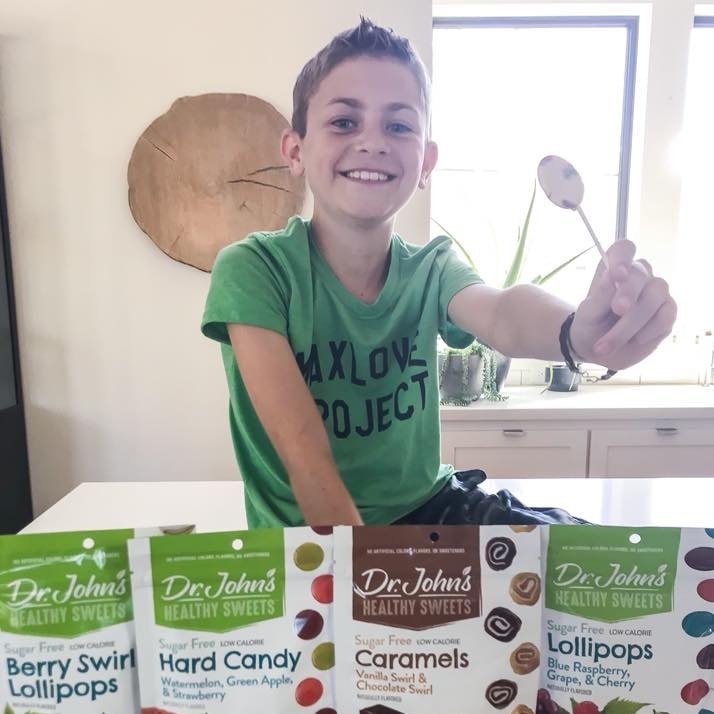 THRIVE® was created after the MaxLove project, a children's cancer non-profit, challenged us to make an all natural lollipop. The base of THRIVE® is fiber, plus you are getting the cavity fighting combination of xylitol and erythritol. On a side note, erythritol is also a sugar free sweetener that comes from plants, has zero calories and is just as effective preventing cavities as xylitol is! To sum it up, in one sugar free lollipop you are getting 20% of your recommended amount of daily fiber, 3.3 gram combination of the xylitol and erythritol, as well as being made from natural ingredients. Oh, and did mention that THRIVE® + Probiotics is available as well?! MaxLove Project is a 501c3 nonprofit organization with a mission to increase the quality of life and reduce health risks for all children surviving cancer, both in treatment and beyond. We empower families fighting childhood cancers and related life-threatening conditions with quality of life care, fierce foods, whole-body wellness resources, education and research. We believe that true health starts when families are empowered to be active partners in their child’s healing.